Congratulations to the City of Tallmadge! - BJAAM Environmental Inc.
Over the past 22 years, the City of Tallmadge has had an ideal development vision for their community. In order to assist in this development, the City of Tallmadge would like to improve the traffic flow at the three-road intersection of Southeast Ave., Eastwood Ave., and Munroe Rd. to a roundabout. In January 2007, the City of Tallmadge acquired the property on the southeast corner of this busy intersection; however, environmental concerns at the property have held up traffic reconfiguration. First developed in the 1940s as a gasoline filling and service station, the property later served as an automotive repair shop, automotive detailing shop, then a grocery store. Within some due diligence, an environmental concern was identified related to the former underground storage tanks (USTs). 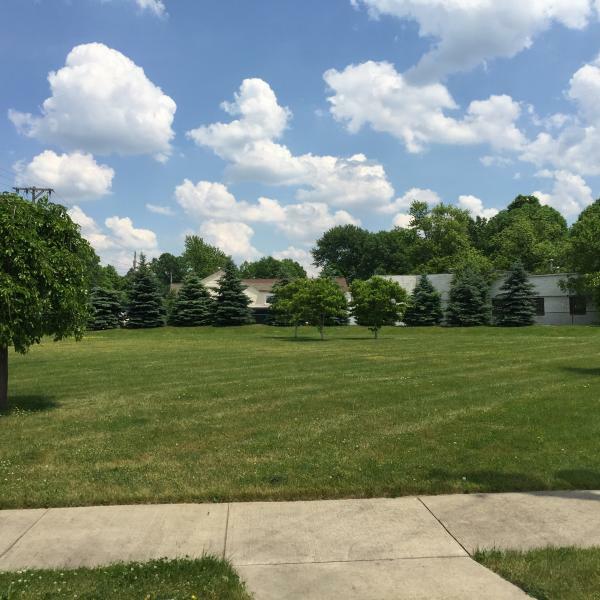 The City of Tallmadge acquired the property, razed the buildings and converted the property into a green space until the environmental concern was addressed, and traffic reconfiguration can occur. In 2014, the Northeast Ohio Four County Regional Planning and Development Organization (NEFCO) submitted an eligibility determination to the U.S. EPA considering the property for assessment funding under their Community Wide Brownfield Assessment Grant. With limited budget for assessments, other petroleum brownfield projects were prioritized. For the past three years, the City of Tallmadge and BJAAM Environmental, Inc. have been working toward remediating and redeveloping this site through funding provided by Abandoned Gas Station (AGS) Grants available through the Ohio Development Services Agency. In October 2016, an AGS Fast Track grant was awarded to the City. A ground penetrating radar (GPR) survey identified one (1) UST along Eastwood Ave. The UST was removed, and several soil borings and monitoring wells were installed. With soil concentrations still above the Bureau of Underground Storage Tank Regulations (BUSTR) action levels, the City was awarded an AGS Cleanup/Remediation grant in June 2018. In August 2018, approximately 813 cubic yards of contaminated soil was excavated and disposed of at a licensed facility. Soil and groundwater sampling following the excavation were below BUSTR action levels and the site was granted a No Further Action from BUSTR on February 26, 2019. Now that the environmental concern is addressed, the City of Tallmadge can now move forward in submitting an application to the Ohio Department of Transportation (ODOT) to fund the road construction preparing this busy intersection for new neighborhood commercial development, just as the community is asking for.